Lola Tarr lost both her parents. She decided to move back to Missouri to live in their house, helping her out financially and through a rough time. When she arrived at the Fordland area farmhouse she finds it has no electric or running water and most of the appliances don’t work. Her car is already in disrepair and with no job, she can’t afford to renew the now expired plates. Top that off, she isn’t feeling well and is diagnosed with cancer. What else could happen? Advocate Genise Davis helped Lola apply for SSI, giving her an income to help support her. 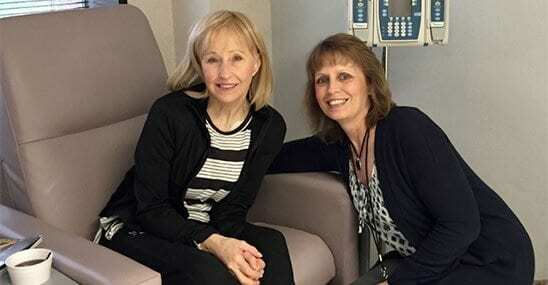 She connected her to two local organizations that offer financial support to cancer patients. One repaired her car, the other gave her a grant. She used it to buy a hot plate and microwave for her home. Genise reached out to the American Cancer Society to obtain a free wig for Lola who had since lost all her hair. Finally, Genise tapped into resources made possible from CoxHealth Foundation donors including free nutritional supplements and emergency funds to help support uncovered costs associated with her care. In a matter of days, Lola’s life had turned completely around. The Advocate she thought might give her a hug and a few phone numbers instead gave her hope and the assurance she could keep a roof over her head while in treatment. Today, the Patient Advocacy program is available to every cancer patient for one reason. A DONOR believed it would make a difference. Jim and Rosemary Glauser started the Glauser Oncology Fund which is the source of funding for the program. Each year the CoxHealth Foundation works to grow the fund and ensure the Patient Advocates remain available. Does the program make a difference? Just ask the 2,714 patients they took care of in 2015. The response we receive is similar to the story above. The Advocates are changing lives, providing compassion and instilling courage for those in this fight. If you’d like to be a part of this amazing program you can send a donation to the Glauser Oncology Fund or be a part of our holiday Knot Forgotten Campaign.